Whether you are looking for an open, grassy site or a shady place in the woods, we have just the spot for you! We can accommodate the biggest of big rigs. All of our sites feature a 100 amp electrical service (includes a 50 amp outlet, a 30 amp outlet, and a 20 amp residential outlet), water, a picnic table, and a fire ring. We also have lots of great full hookup sites that include sewer. Some of our weekend sites include cable – please ask when making your reservation to check availability. 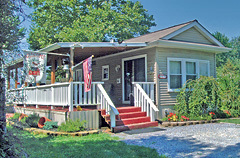 Additional persons: $10.00 per night / $25.00 per week / $100.00 per month. Visitors: $5.00 per day / $10.00 overnight. Reservation Policy: All reservations must be paid in full at time of reservation, including electric deposits if applicable. All reservations for Holiday weekends require a 3-night minimum stay. Holiday weekends are Memorial Day, 4th of July, and Labor Day. Cancellation Policy: A 48 hours in advance cancellation is required for a refund on all campsites. They say “there’s nothing like the great outdoors” AND “there’s no place like home”. We don’t think you should have to choose! Our Log Cabins are nestled in wooded areas, so you can explore nature by day and come “home” at night to all of the things that you couldn’t pack in the car … including the kitchen sink. Whether you stay in our Rustic Cabins or our Deluxe Cabins, both styles are professionally built, quality crafted, and designed with you in mind. All you have to do is choose which cabin is right for you! 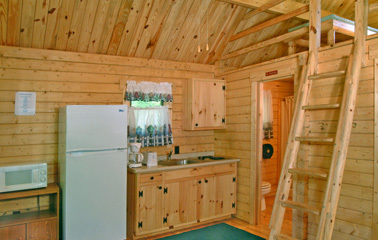 Rustic Cabins sleep 4 people comfortably. Each cabin offers a front porch, small refrigerator, one double bed and one bunk bed, electric lights and outlets, fire ring, picnic table, and a charcoal grille for cooking outside. 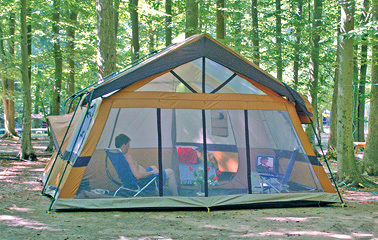 All the amenities are there to make you feel like you’re camping at home. Please note: our Rustic Cabins do not have heat, air conditioning, or running water but there is water available on the site. 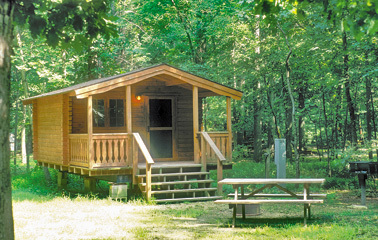 Deluxe Cabins are truly your home away from home. Overlooking one of our many ponds, our Deluxe Cabins are designed to sleep 8 people comfortably and provide all of the amenities of home in a camping atmosphere. 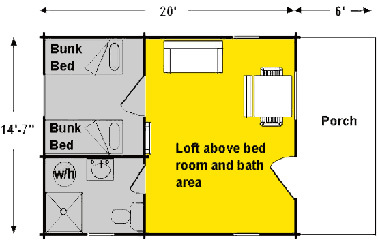 Each cabin offers one enclosed bedroom with two bunk beds, a loft with 2 single beds, a full bathroom, a full working kitchen, futon couch, cable TV, heat / air conditioning, electric lights and outlets, fire ring, picnic table, and a charcoal grille for cooking outside. 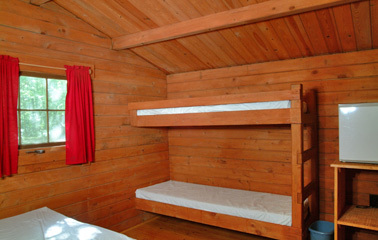 Rustic Cabin rate based upon 2 adults and their children under 18 years of age. Deluxe Cabin rate based upon 4 adults and their children under 18 years of age. Reservation Policy: All reservations must be paid in full at time of reservation, including electric deposits if applicable. All reservations for non-Holiday weekends require a 2-night minimum stay. All reservations for Holiday weekends require a 3-night minimum stay. Holiday weekends are Memorial Day, 4th of July, and Labor Day. 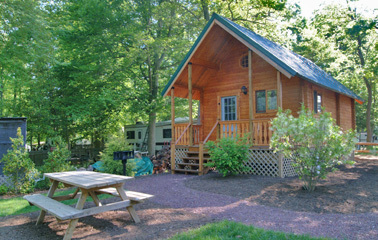 Cancellation Policy: A 7-day in advance cancellation is required for a refund on all Cabin and Camper Rentals. 1) No pets are permitted in the rental units or on the porches. They must be secured outside. 2) No smoking in the rental units or on the porches. 3) No cooking on the porches of any rental unit. 4) No cooking inside the Rustic Cabins. 5) No air conditioners may be brought from home. 6) Rental units must be left clean and undamaged. 7) Campground management must accompany you at the time of check-in and check-out. 8) No open flame of any type inside the rental units. 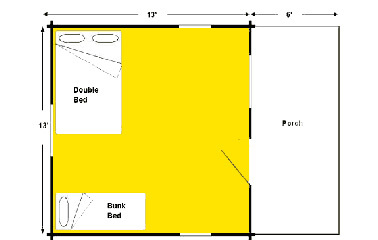 9) You will need to provide your own pillows and linens or sleeping bags. Seasonal rates are available for 2019 on request. Our seasonal camping runs from April 1st to October 31st which is when the water is on to our seasonal sites (the dates are approximate as they are cold weather dependent). 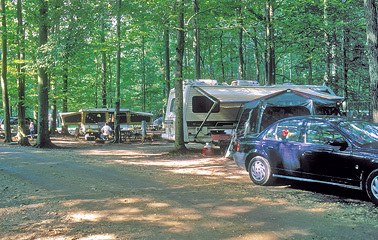 The seasonal rate allows you to leave your camper on the site over the winter months at no additional fee. Winterizing your camper is your responsibility. The seasonal rate is payable with an established payment plan. Details may be obtained through the Camp Office. Please Note: The campground is closed to camping during the month of January. 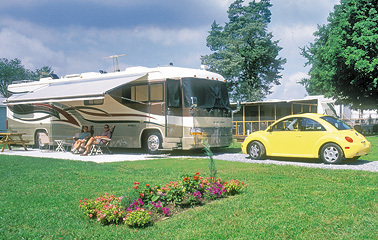 You cannot reside or stay full time in your camper.